Growing: Â Moderate This 80% indica and 20% sativa hybrid marijuana strain is the result of meticulously searching for the ideal cannabis strain and eventually resulted in crossing 3 varieties namely Warlock female40%, AK47 female 20%, and Sensi Star male 40%. Â The result is a highly stable weed plant that can be grown easily as it does not grow tall and requires not much maintenance to flourish. Â It is especially applicable in an indoor type of growing system and with its small bushy built can shell out pretty decent yield of as much as 500gr/m2.Flowering time for Star Gazer can be expected once it reaches 60 days and it will grow buds that are compact and colourful with yellow to orange hairs and richly sprinkled with THC crystals. Â While flowering, the buds will emit a peppermint aroma and this will be carried to its taste that is similar to having mentos in your mouth. 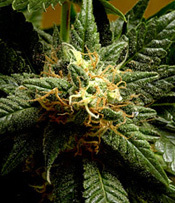 The effect when smoked is indicative of its indica lineage and will belt out a relaxed feeling that promotes good mood. This is an excellent strain to grow thatâ€™s perfect for my small grow room.Â Lots of potent buds that are a joy to look at and a pleasure to smoke.